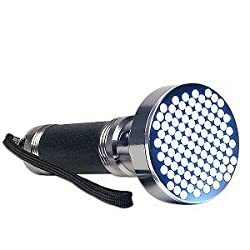 At one time 100 LED flashlights were the top of the line, but these days they are merely ordinary so the market has been taken over by mostly generic products. Still, there are some very good 100 LED flashlights available as the following list illustrates. Since 100 LEDs packed side by side always take up about the same space, your choice is all about the handle and what type of batteries power the flashlight as well as the product quality. 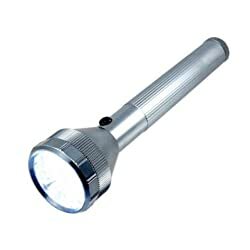 This generic 100 LED Aluminum Flashlight is sold on Amazon by a number of vendors and is a reasonable product, but not really up to strenuous duty. The one linked here is priced at around $16.00, but many others sell it higher. It features 100 super bright white LEDs with 100,000 hours LED bulb life in a silver and black color anodized hard aluminum shell with a rubber handle, rubber on/off switch, and hand strap. This 100 LED flashlight is powered by 4 AA batteries (not included) and the dimensions are 7″ H x 2.75″ W x 2.75″ D.
If you are looking for a name brand and solid quality in a 100 LED flashlight, Senter offers the (formerly Big Kahuna) Amazing 95 LED Aluminum Flashlight powered by 3 D cells (not included) in the traditional big flashlight form factor. The Super-bright LEDs last up to 100,000 hours and the weather resistant aluminum barrel and lamp-head with acrylic lens stand up to rough treatment. The convenient positive-action thumb switch prevents the light from coming on inadvertently and draining the batteries. The overall dimensions are 12-1/2″ in length with a 1-1/2″ barrel-diameter and a 3″ lamp-head diameter with a weight of 1.9 lbs with batteries. The street price has been reduced to about $18.00 and so for a little more than the flashlight above you can step up in quality. Last updated on Friday, August 10th, 2012 at 10:10 am	and filed under LED Flashlights.